Smile! Coo! Chase! Share! Laugh! Young children have similar thoughts when they enter somewhere new. Some may take a few minutes to warm up, some may cling to you their trusted rock of strength, and others just run into the room like they own it! All children want to know they are in a safe place, there are others around that are familiar, and what they can do next. The first time I meet a new child I try to be really conscious of that child’s body language. If they are coming in for a hug I’m open-armed. If they are in someone’s arms with shyly smiling, I’ll make eye contact and smile back until they giggle. And if they are completely tucked away trying to hide into their parent’s body, I say hello with my name, tell them I’m excited that they are here, “Mommy is staying, don’t worry!” if needed, and then give them space. The best way to get to know someone smaller than you is to get on their level; lay on the floor, crawl around, squat down. Showing the child that you equal in wanting to get to know each other will make them instantly more comfortable! 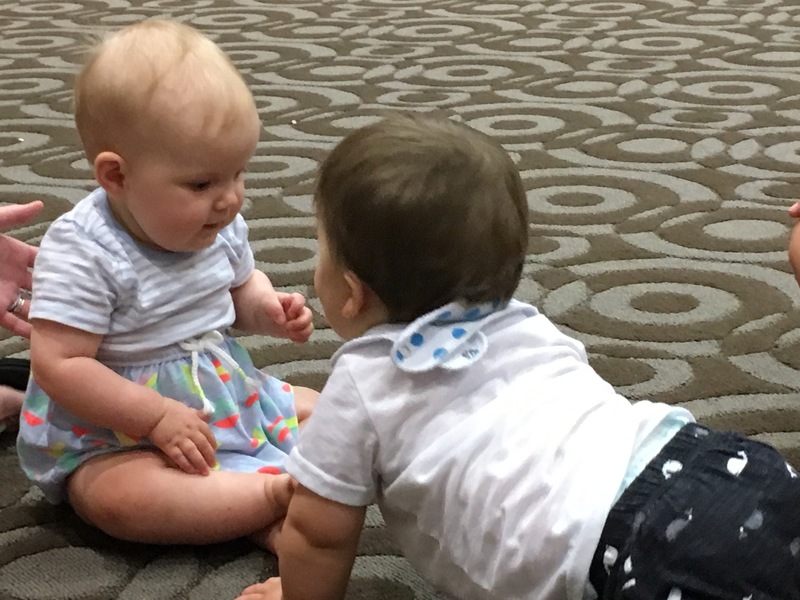 When we respect where each child’s individual comfort level is when first meeting, they will quickly start to open up as they are more and more comfortable with their surroundings. For some, that means 3-4 weeks before they walk in on their own or say hello to anyone else, and that is completely fine! As you can see from the photos below, babies are naturally curious about other people! They love staring at other faces, touching to see what a nose feels like, and testing to see what reaction they can create with their movements. Young babies tend to pull hair and pat others right in the face all the time! Please don’t think your little one is every being mean or rude, they are genuinely curious about the other baby. They want to explore this fascinating stuff growing out of the top of your head. 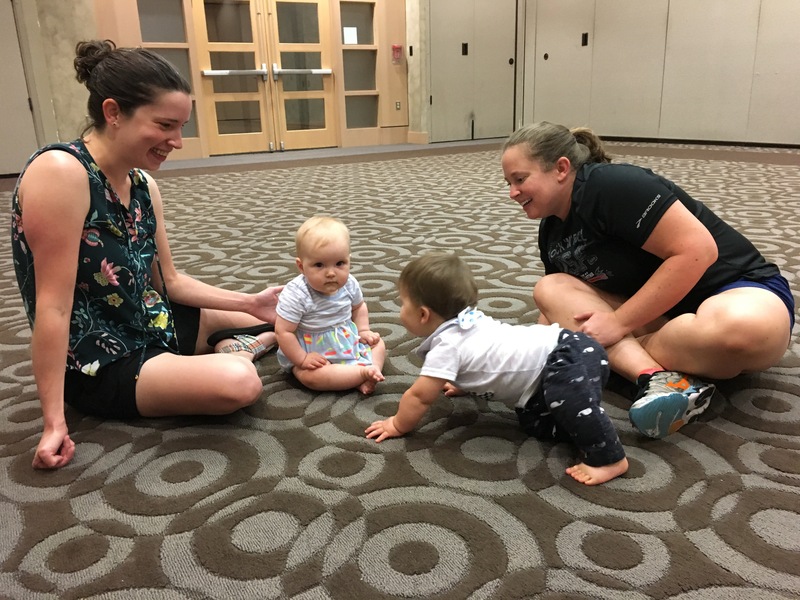 They may be thinking, “You have that thing in the middle of your face that is so cool!” The mamas in the above photos did a fantastic job letting their little ones check each other out during some tummy time while jumping in when the babies became a little feisty. After a few weeks, the same two babies started showing reactions when the other arrived! They would light up with a smile, coo or yell out, and start to crawl towards each other. They made a friend! From seeing each other week after week in class, they started to realize that this place is where I see my favorite people. For older children, they may find someone else also loves to run around like crazy which turns into an instant friendship over the chase. Maybe they both love making faces in the mirror. Or others are more reserved while they stay close to their parents but realize they both love patting the drums near each other. All of these are great examples of getting to know someone else in the class who shares a common interest! Sharing is a super complex topic we as adults try to teach and enforce with young children. The idea of something belonging to everyone is just earth-shattering, mind-boggling news to little people. Maybe you’re familiar with the Toddler Creed? “If I want it, it’s mine. If I give it to you & I change my mind later, it’s mine. So how do we fairly teach this in a large group setting? For some activities like scarves and egg shakers, each child receives their own item. They can choose which one they want, they can trade with people around them, but ultimately they have something that for 5 minutes they “own”. For other activities, like free instrument exploration, the children start to learn how to be a part of this new sharing dynamic. Some will jump right into the buckets looking for the most interesting item. Others wait and enter more slowly/carefully to find what they are looking for. And almost always, the same toy will be found by more than one child. One way to avoid a super sad situation is to always have duplicates! Unfortunately, that still doesn’t work when 1 of the 2 same toys is in the washing pile. When this occurs, we try to find something similar (another shaker or tapping instrument) for one of the children to enjoy. Sometimes it works, sometimes the struggle is real while they wait for their turn. Usually, this resolves itself pretty quickly as we have lots of fun things to explore, but acknowledging your little one’s feelings at the moment is super important for their own social/emotional growth. “I know you really wanted the blue maraca that someone else is using and I can see that makes you feel sad. I’m sorry that you feel sad. 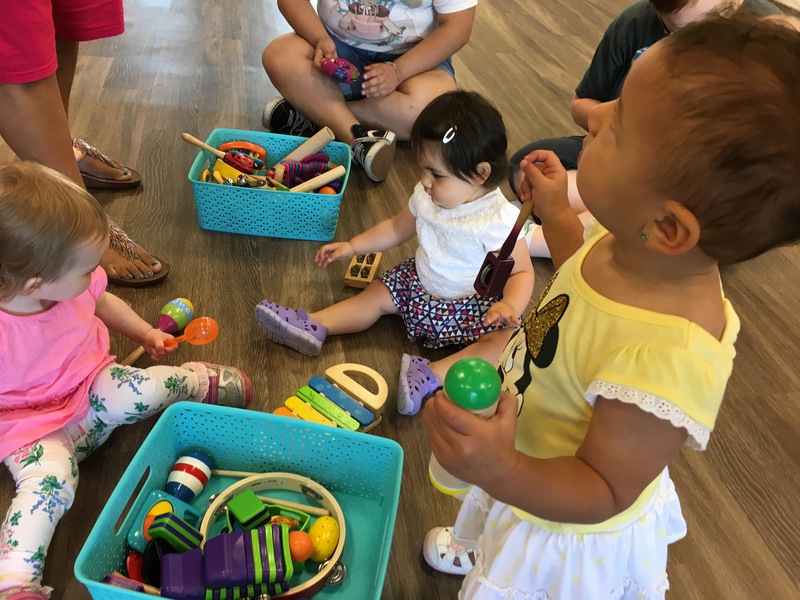 Would you like to find another blue toy or another colored maraca to play with?” And most times, that is all they need to hear to feel understood, reassured, and ready to play again! One of the socialization aspects I love to see in this class is how children not only learn from each other but from new adults too. They see new mommies, daddies, grandmas, uncles, etc. Some look the same, many look different from the family members they know. What these little people don’t realize is how much they are starting to learn about trusting and loving people all cultures. 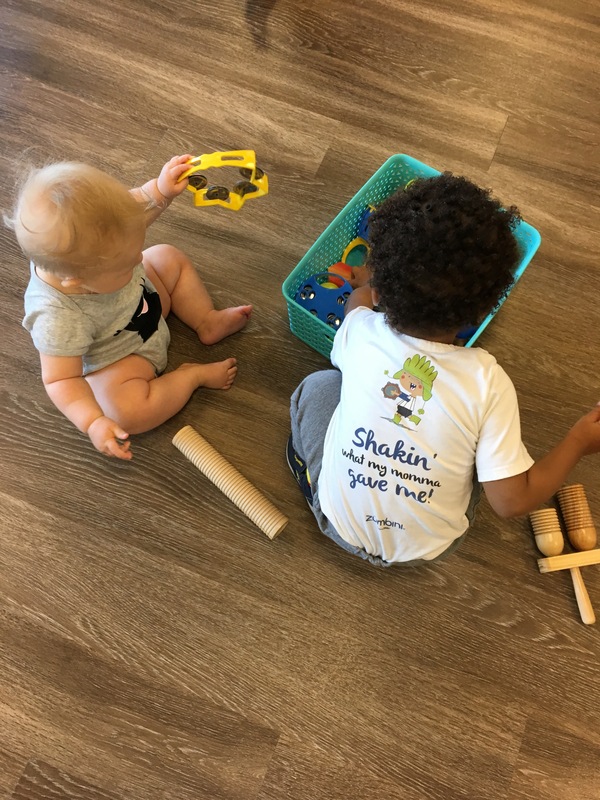 When young children are exposed to different types of languages, skin tones, abilities, ages, and family structures, they are learning that although it may be different than they are used to in their own home, this new person can also be someone to share the joy with as well. Learning to trust new people is a huge part of young children’s development. By giving them experiences with others who look, sound, or smell different from themselves, they are internalizing new understandings about the people in the world around them. Thought Zumbini was just a place to sing and dance? Now you know lots about the social development we encourage each week as just one of the important components of this class! 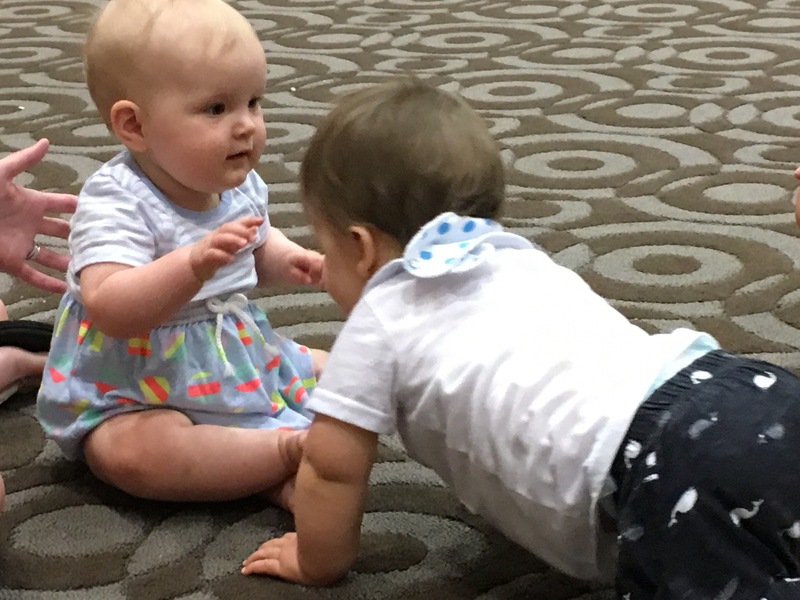 Click here to learn more about coming to a class with your little one soon! Lots of Free Classes This Weekend At NBC4’s Health & Fitness Expo!Again again again! How Repetition Helps Development!